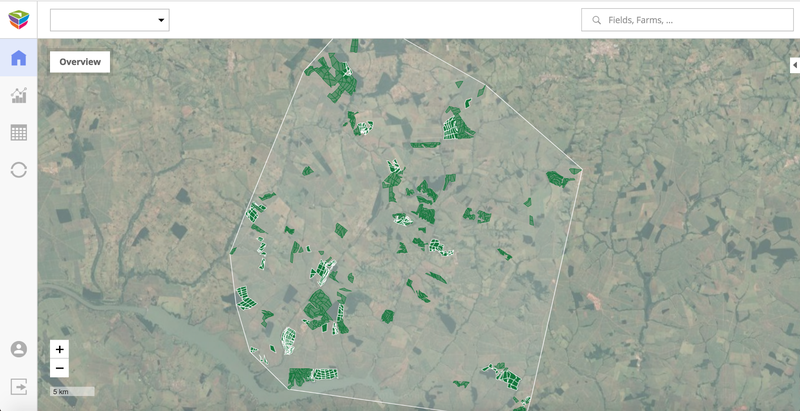 In one of the previous blog posts, we’ve analyzed in detail the importance of accurate detection of planting gaps in large sugarcane fields to minimize losses and maximize yield by timely secondary replanting. In this post we would like to give you a better overview of our product to address this problem and boost the productivity of the entire crop cycle. Gamaya solution is commercially available today and includes a free trial offering (see the details below). 1. Based on the statistics from the FAO the average productivity of sugarcane in Brazil is about 80 tons per hectare. 2. Average multi-year losses due to planting failures can be somewhere between 15–25%. Let’s take the minimum value of the range — 15%. 15% of losses due to planting gaps in sugarcane is about 12 tons per hectare. 3. 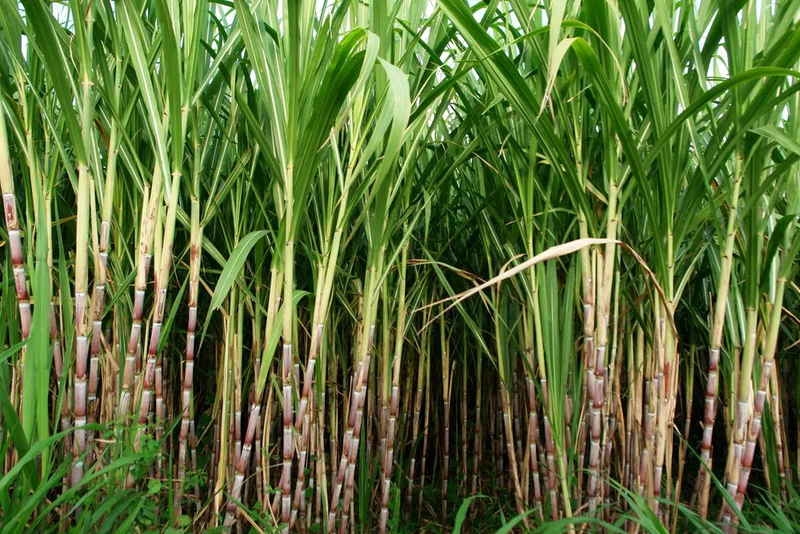 Average value per ton of sugarcane in Brazil is estimated at R$ 70, according to CONSECANA — Council of Sugarcane Producers of the State of São Paulo, Brazil. 4. Let’s assume that 50% of planting failures can be addressed by secondary planting if sugarcane growers have timely access to all information and statistics about planting gaps on their fields during first 1–4 months of the sugarcane development. 5. Based on the information above, potential annual economic benefits are estimated at R$ 420 (130 USD) per hectare. The yield benefits are expected for all subsequent growing seasons. 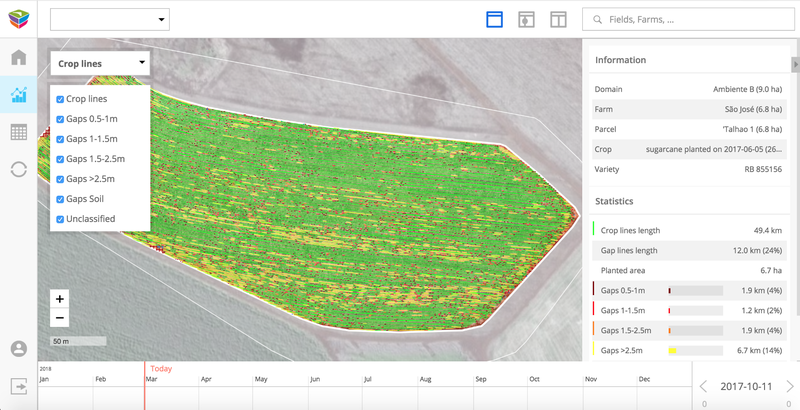 1.Fully automated detection of crop lines. Detection of lines of complex, arbitrary geometry. Detection of double planting lines. Adaptation to irregular and non-parallel crop lines. Atmospheric correction and cloud shadow removal. 2. 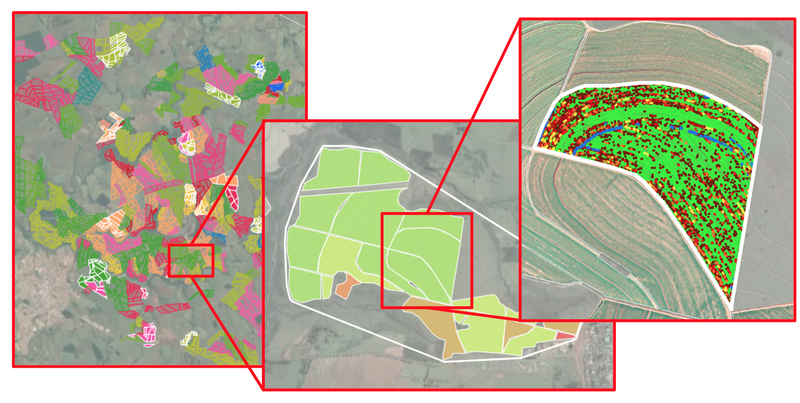 Highly accurate and robust detection of planting gaps and harvesting lines. Ability to validate the accuracy of detection by manual inspection of HD-RGB images. Automated exclusion of trees and nature preservation areas. Automated detection of roads and viaducts. 3. Detailed statistics for each field, split into relevant categories. Crop lines length and gaps length in km and %. Detailed classification of gaps based on their length. Analysis of the economic impact of planting gaps. Export of statistics to Excel and other industry standard formats. 4. Export of harvesting lines and planting gaps to industry standard .shp files, compatible with CAD and most field machinery software. Harvesting lines can be uploaded to harvesters to follow precisely lines during the harvesting process. 5. User-friendly web portal allowing easy navigation and overview of products. Please see a detailed overview of Gamaya web platform below. Gamaya web platform is a professionally designed online portal that aims to provide comprehensive overview and analysis of Gamaya products and associated statistics using multiscale interface, that allows easily switch from a domain to farm and individual fields. 1.Overview of all domains, farms and individual fields. 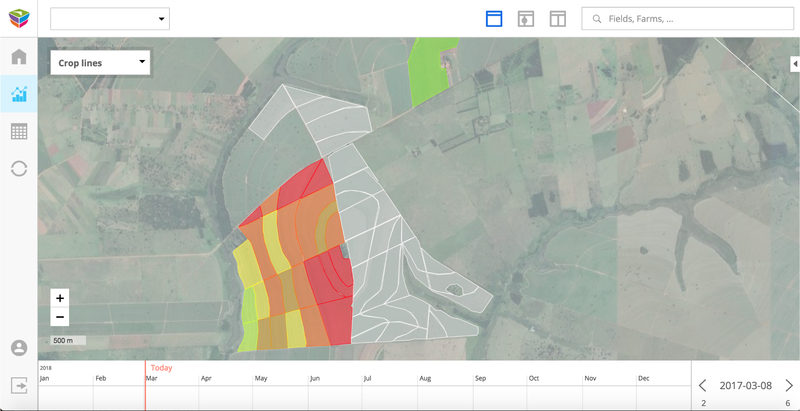 Farm and individual field view. Ranking of fields based on their performance. 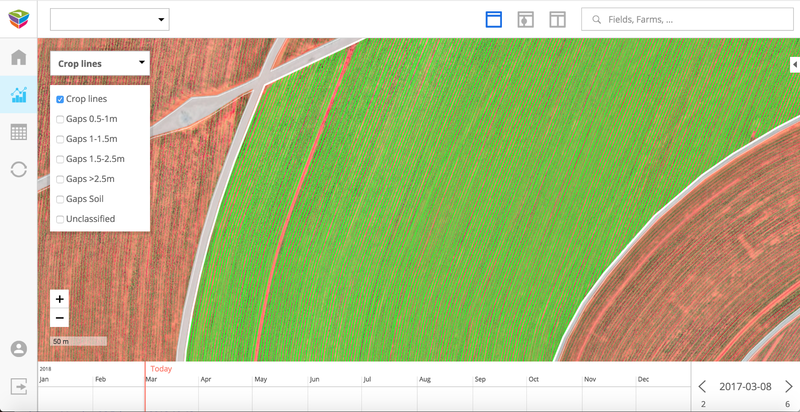 Intuitive and friendly interface, that allows easy navigation between fields and farms. 2. Seamless multiscale interface. Scale-adaptive efficient and easy navigation. Multiscale analysis and statistics. Total situational awareness. 3. Extended capabilities to analyze and compare different products. Analytical comparison of products. Constant monitoring of issue progression over time. Switching between different time points during a growing season. 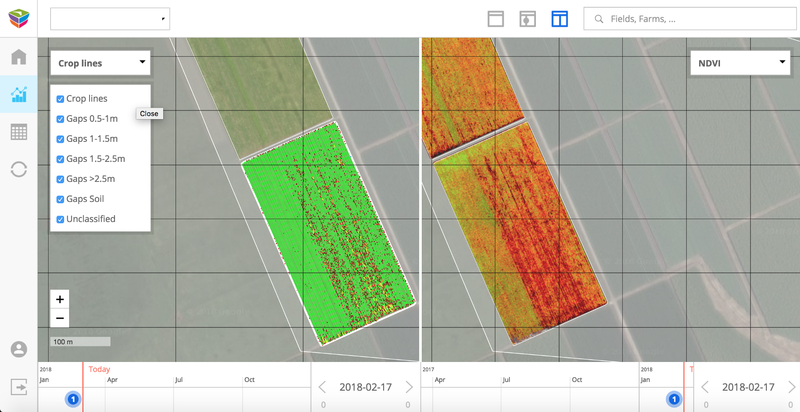 Gamaya provides the free trial offering, that allows testing our solution for planting gaps for free on an area of maximum 2’000 ha during 4 months, subject to a condition that drone imaging is carried out and paid by the client. 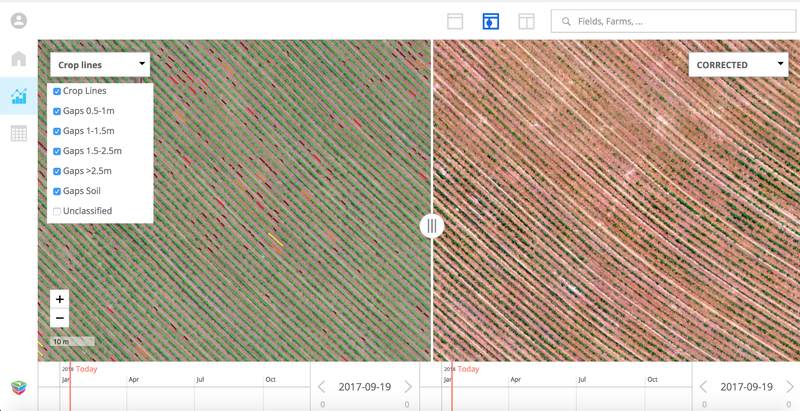 If you already have drone-based imaging of young sugarcane fields (2–4 months old), then we can use your data and provide a demo of our solution based on your existing information if it’s in line with our data quality standards. If you want to test our solution or request demo, please contact us or send us an e-mail to the following address: info@gamaya.com. Thank you.